Our Doctors are available from 8.00 am - 6.30pm 5 days a week at Sixpenny Handley Surgery and / or Broad Chalke Surgery. All members of the core clinical team are available at both surgeries at various times. Tuesday pm - Sixpenny Handley Surgery is closed & Broad Chalke Surgery is open. Monday afternoon and all day Wednesday, Broad Chalke Surgery is closed, Sixpenny Handley Surgery is open. If one site is closed on a weekday, a doctor will be available so please ring the usual surgery number and your call will be answered. 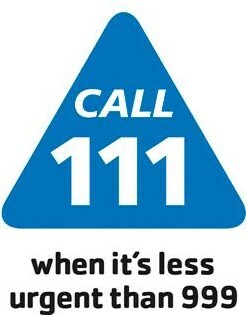 On bank holidays please call 111 for advice. * Whilst we are normally open late on a Monday evening, this does not apply to bank holidays and a few other days. If you are planning to visit the surgery other than for a prebooked appointment, it is always worth phoning before 6:15 to check if the surgery will be open. A home visit by a nurse, doctor, Emergency Care Practitioner (ECP) or paramedic. If having been in contact with the out-of-hours team they advise that you need to be seen by your own GP please take the initiative and call the surgery on the next working day. Don't wait for us to call you as there is sometimes a delay in messages from the out-of-hours team reaching us. You can simply turn up and be seen. No appointment is necessary in the times advertised. For non-urgent health information or advice, please phone NHS 111 on 111.